Dr. Dai You-Yu is currently an associate professor of Department of Tourism Management at the International Business School of Shandong Jiaotong University, and he concurrently serves as the leader of international cruise crew management. 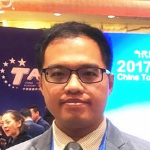 He holds a Ph.D. in Management from Graduate Institute of Recreation, Tourism, and Hospitality Management at National Chiayi University in Taiwan. He has taught at the China-ASEAN International College of Dhurakij Pundit University in Thailand, and has served as a marketing professional master tutor. His research interests include tourism management, marketing, consumer behavior, and sustainable tourism. Dr. Dai has published 10 articles in academic journals such as SSCI, CSSCI, EI and TSSCI class, more than 30 conference papers, 1 book and one chapter in a book. He have been anonymous reviewer for international SSCI academic journals many times, such as Tourism Management, Asia Pacific Journal of Tourism Research, International Journal of Contemporary Hospitality Management, and others. He was awarded as "outstanding reviewer" of Tourism Management in Elsevier.